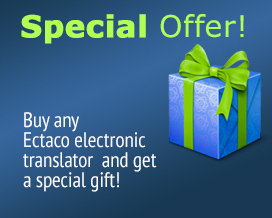 The ECTACO Partner EL500 is a unique bilingual translator that combines all the most useful linguistic resources in a single, affordable handheld package for complete understanding anytime, anywhere. This talking electronic dictionary is created using the innovative Text-to-Speech technology to bring you English speech synthesis and an English <-> English dictionary with over 450,000 entries. All that makes it a great learning tool and a versatile linguistic resource. It also includes great built-in dictionaries: English <-> Latin and Latin <-> English. An English thesaurus is added for aiding language professionals. You can learn Latin with this dictionary.